Available in printed and ebook formats. Here’s the ultimate resource on how to put forth the best executive image style imaginable. 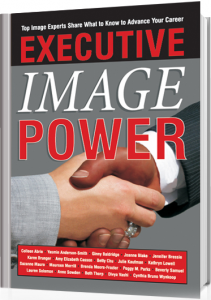 Executive Image Power is a comprehensive guide that spells out the essentials to success, whether it’s dining or technical etiquette, civility, or navigating the cocktail party with style and grace. Chock full of great tips from 20 leading executive image consultants in North America, Executive Image Power shares strategies for personal power color, details that matter, capsule and travel wardrobes, body language all serving to sprint to the executive suite with a winning attitude. This collaboration of global image experts also includes guidelines on creating an influential business casual wardrobe, articulating executive body language, closet organization, presentations, and even Chinese protocol. My chapter, Tech Etiquette, Perfecting the Art of Modern Communication, makes it clear that e-mail, voice mail, and texting have the same “rights and wrongs” that wardrobes and grooming have. Available only in printed format. My local networking often involves Atlanta Women in Business. 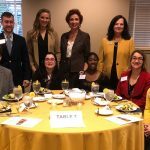 I love the organization’s quarterly luncheons and am honored to serve as Community Liaison on its Board of Advisors. When the organization launched a “Book Project” for its members, I immediately jumped in! In it, you will not only find my path toward successful business ownership, but also those of my co-authors Marla Brown, Angela Durden, and Eleanor Morgan. This book includes tips and advice for new business owners and women on corporate career tracks who dream of “someday” owning a business of their own. Always dress for your next job. Zip up your adult suit when you walk out the door. Dress every day as if you were going to run into your ex. Be consistent in all phases of your life. Bring the essence of “you” to the outside by the way you look, by the way you behave and the way you communicate. This way people will perceive your level of accomplishments and values the minute they meet you.